Barbie and her sisters in a parang buriko tale mga manika. . HD Wallpaper and background images in the Barbie pelikula club tagged: barbie. I like their dresses. I wonder if there will be a party in the end of the movie where they wear these dresses. I guess they can't ride the horses dresses like this. Don't forget we're talking about Barbie, Vi... Corinne could ride with a skirt ;) LOL!!! Wow!! Beautiful dress!!! Maybe in the end movie they wear these dress!!! Wow they sure are ugly. I just don't like their headmolds. I'm not very familiar with Barbie headmolds, do they always look like this? Yes, they do Lexie. And you know how they make those heads: PAINT. Or they use some kind of machine to do the faces. But I noticed that Skipper's eyes is not good. That's an error. Those headmolds are pretty typical of Playline Barbie, in my experience at least. 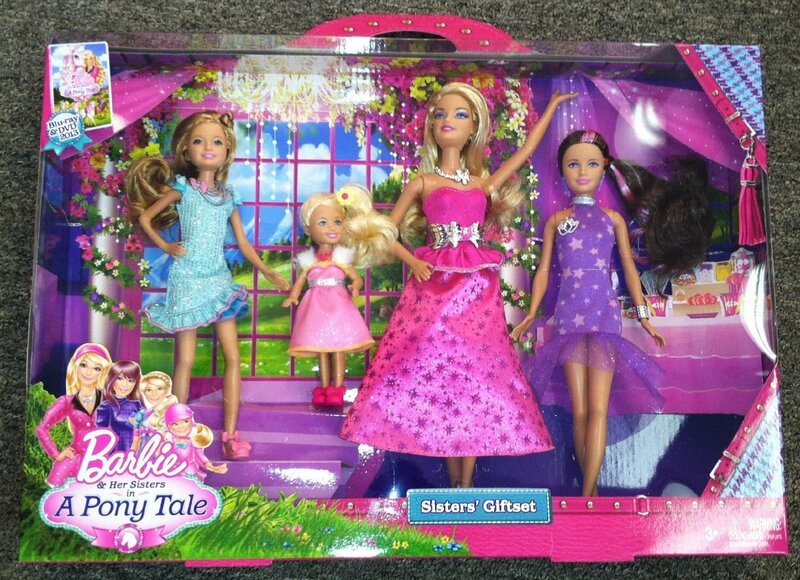 I quite like Skipper and Stacie's dresses, but I'm really not impressed with Barbie's. For a moment, I thought she was Tori. I wish Mattel would be a bit more original. Am I the only one who thinks Stacie looks more mature than Skipper? I'm not saying it because she looks taller than her since she's on a higher stair, I think it's because of the facemold and expression. And I noticed Skipper's teeth are not shown. BARBIE Sisters Gala Gown Gift Set. In the new story, "Barbie & Her Sisters in a Pony Tale," Barbie and her sisters head to the horse academy, where they attend a festive gala dressed in their prettiest ball gowns. Each is accessorized with pieces that match their outfits and styles, and they all look amazing! These sisters are going to have a ball! Includes 1 Barbie doll, 1 Stacie doll, 1 Skipper doll and 1 Chelsea doll.